Adrian Slater and Mark Sumpter, in the Eurotech Porsche GT3-R, dominated Saturday’s one-hour Britcar race, leading from lights to flag, and welcome series visitors Paul Drayson and Martin Stretton, in Barwell Motorsport’s GT3 Aston Martin DBR S9, were runners-up. Richard Chamberlain posted pole fairly late in the morning’s qualifying session, his 1:31.723 in the Porsche 935 replica being nearly three-quarters of a second quicker than Sumpter’s best. 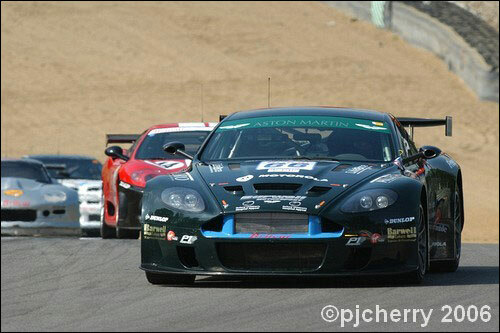 Martin Stretton was third in the Aston, then Calum Lockie, sharing the Hargreaves Ferrari 360 with Bo McCormick, fourth, and the first of the GT Cup runners, Mick Mercer and Rupert Bullock in the Topcats Marcos Mantis, in fifth. The Emotional Engineering Vauxhall Monaro, of Steve Hyde and Matt Griffin was sixth, then, further back than usual, the Peter Cook Porsche GT3-RS, Peter driving alone in this relatively short race. 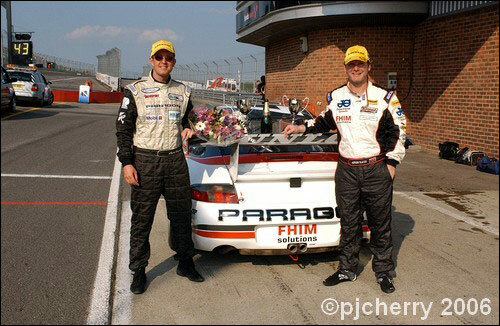 With the 911virgin.com Porsche 911 undergoing repairs, Henry Firman and Pete Morris were using Pete’s Porsche Open GT3 machine, and lined-up eighth. 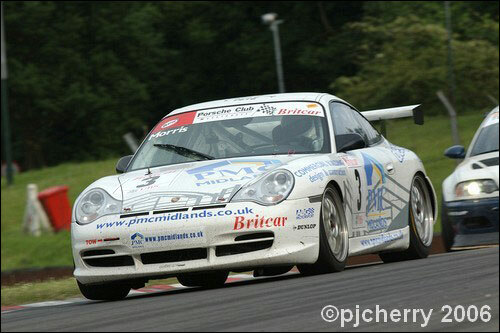 Series newcomer Paul Livesey was ninth in his Porsche 996 RSR, and the Opel V8 Star of Nigel Mustill and Steve Hall rounded out the top ten. New cars further down in the mix included Marcus Clutton’s Marcos Mantis (the tell-tale livery revealing that this was once the Eclipse challenge-spec machine), the Corsport Marcos LM500 of Stephen Keating and Mark Powell, the Topcats TVR Sagaris, rebuilt from one of the team’s Tuscan Challenge cars, and in the hands of husband and wife duo Warren and Charlotte Gilbert, and finally, the newly-completed BMW E46 M3 of race-returnees George Agyeton (seven years away) and Brands Hatch favourite Dave Coyne (ten years out of mainstream circuit racing). It was Sumpter who took the lead as the lights went green, with Drayson slipping into second as John Allen, starting the Chamberlain Porsche, dropped back slightly. Mick Mercer, though, had stormed through from the third row, and had the #6 Mantis up to third by the end of the first lap. This was to be short lived however, for he quickly fell into the clutches of Peter Cook (below), then Steve Hyde’s Monaro, as he visibly slowed, and then stopped out at Stirlings, necessitating the deployment of the Safety Car. Just six laps in, this was too early for mandatory stops, though both George Aygeton and Paul Livesey took the advantage of a quiet period to visit the pits. Mercer’s Topcats Marcos was recovered to the pits, wheel bearing failure requiring Brian Howard and his ace spannermen to get to work, and the field went green again after four laps under caution. With 20 minutes – one-third distance – on the board, Sumpter led, followed by Drayson, Cook, Hyde, Richard Jones in the Simpson Ferrari F40, and Pete Morris. The charging Cook soon relieved Drayson of second, causing the Aston to kick up the dirt on the ragged edge of Clearways as Drayson attempted to claw back. Allen had handed the orange Porsche to Chamberlain, who was looking for a traffic-free lap to unleash the beast, and Cook took his mandatory stop14 laps in. He would shortly return, however, his race effectively over with a broken wheel. 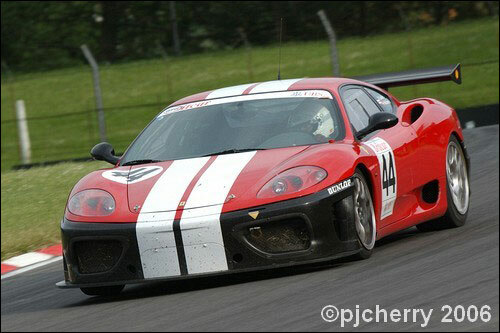 David Back, in the black Damax Ferrari 360, had clashed with Tony Rodriguez’s BMW, and was out of the race, too. As the half-hour ticked over, the bulk of the mandatory stops were made, though Sumpter, and Kevin Hancock, in the Jemco Marcos Mantis, made late calls on the very sill of the pit stop window. Calum Lockie, having taken the Ferrari 360 over from Bo McCormick, was on a charge, as was Chamberlain, now up to second position. So, with the field now settled, and fifteen minutes left to run, Adrian Slater’s Eurotech Porsche held a six-second advantage over Chamberlain, then Stretton’s Aston Martin a further five seconds back, and the charging Lockie fourth. Lone driver Paul Livesey was an impressive fifth, then the Firman/Morris Porsche, and Matt Griffin in the Monaro. Charlotte Gilbert, returning to racing after “maternity leave”, was having a good run in the new Topcats Sagaris, though the large splitter was dragging a little. There was drama as the race drew to a close, Chamberlain driving straight into the garage with a fuel pump problem, and the #4 Topcats Marcos of Jon Harrison and Richard Gomes retiring with, like the #6 car, wheel bearing failure. 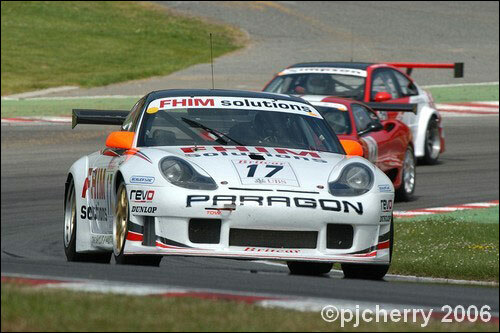 Adrian Slater took the win in the Paragon Porsche, completing 35 laps in the 60 minutes. Martin Stretton in second was six seconds ahead of the charging Lockie, who might have got on terms with the Aston, given a few more laps. 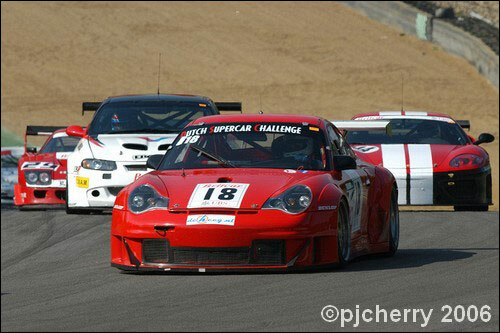 Paul Livesey brought his Porsche 996 home fourth, and it was a good result for the Emotional Monaro, fifth. Nigel Mustill and Steve Hall did well in the Opel V8Star, finishing sixth, and Pete Morris and Henry Firman, in a car that has barely raced beyond 20 minutes, were GT Cup class winners, in seventh overall. “It was very hard on my poor car,” commented Morris. 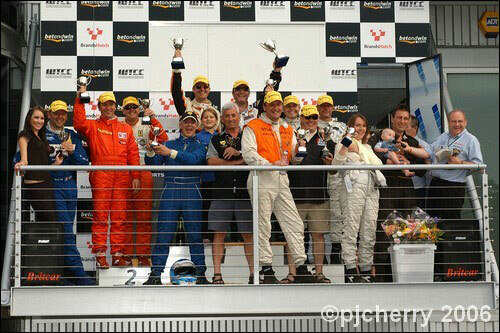 Well-deserved runners-up in the Cup class were Kevin Hancock and Leigh Smart in the Jemco Marcos Mantis, the car lacking power steering for much of the race, and it was a surprise podium for Warren and Charlotte Gilbert in the untried and untested TVR Sagaris. It was Adrian Slater and Mark Sumpter, in the Eurotech Porsche, who again dominated Sunday’s two-hour Britcar race, whilst runners-up Bo McCormick and Calum Lockie capitalised on a late additional pit stop for the Barwell Aston Martin. The grid was set by the result of Saturday’s race, and there was consternation as the cars set off for their pace lap, since Steve Hyde’s Monaro was leaking oil. When the lights turned to green, Sumpter immediately assumed his position at the front, with Drayson in tow in the DBRS9, and a fast-starting Bo McCormick up to third. Stephen Keating executed a quick spin at Graham Hill in the Corsport Marcos LM500, and, as they came round to complete the first lap, Hyde brought the Monaro in to examine the oil concern. “It doesn’t look like a mechanical problem – maybe it’s been over-filled,” hoped Matt Griffin. Whatever, the Vauxhall would play no further part in the race. Steve Hall was absolutely flying in the Opel V8Star, deposing McCormick for third on lap two, but Richard Chamberlain, starting from 12th on the grid (as the best of Saturday’s non-finishers), was making no progress whatsoever, and drove the orange Porsche straight into the garage, a suspected dropped valve ending his race prematurely. Chamberlain, Allen, and the Chimptune team have gamely accepted the odds that have been stacked against them, and have encountered some wretched mechanical misfortunes too. Their time must surely come soon. A clash at Druids saw Andy Ruhan’s Damax Ferrari needing recovery, so the Safety Car was sent out, with just three laps run. Peter Cook had been moving rapidly through the order after staring near the back of the grid, and, once the field was let loose three laps later, he was past McCormick, past Hall, and into third. McCormick, in fact, was holding steady whilst all around him were bidding for position. Once Philip Hopkins, in the Simpson Motorsport BMW M3 broke clear, Bo McCormick had Jacopo Sebastiani’s Ferrari F40 on his tail, then Pete Morris’s Porsche. Having taken McCormick Sebastiani made a move on Hopkins for good measure, though his tenancy in what was now third place was short-lived, for he had a dust-raising drive through the gravel at Paddock, undoing his good work. Steve Hall had relinquished his third place a little earlier by making a pit stop, but now the Opel V8Star was parked at an angle near, but not on, the tyre wall coming down the hill from Druids. And then, after several laps stationary, it was gone. George Agyeton was called in by the officials to fix his dragging splitter on the BMW, and McCormick had got second wind, claiming his place back from Morris, who was now in danger from Jon Harrison, who was on a charge in the Topcats Marcos Mantis. Harrison got past on lap 21, but good news for one Marcos was bad for another, as Kevin Hancock’s Jemco machine made a smoky descent from Druids, and shot straight into the back entrance to the pits, its engine blown. Doubly bad news for Marcos, in fact, as a few laps later, Mick Mercer brought the #6 Topcats Mantis into the pits, its diff broken. “…..and it’s only nine years old – there should still be a year left on the warranty,” was the good-humoured response from Topcats’ race engineer. With seventy minutes left to run, and just before the expected round of mandatory stops, it might be a good idea to recap on the positions; Sumpter in the lead, 14 seconds in front of Cook, with Drayson’s Aston Martin a further 26 seconds adrift, then Livesey’s Porsche, the recovering Bo McCormick, and Hopkins’ BMW the first of the lapped runners. Those pit stops started almost immediately, Drayson first, then Sebastiani, then Cook, but this wasn’t to be a normal stop, for the red Porsche was pushed back into the garage. Next down the pit lane was McCormick’s Ferrari, handing over to Lockie for an anticipated 60 minutes of fireworks. Sumpter stayed well away from the pit lane, as did Hopkins, and Pete Morris, the trio now holding the top three places, but with 45 minutes to go, they all came in, and, whilst Sumpter had done enough for Adrian Slater to retain the lead, both Henry Firman, now in the PMC Porsche, and Tony Rodriguez, in the BMW, slipped a little further back. Franck Pelle was now back out on the track, the red Cook Porsche having lost ten laps in the garage. “It was the gear linkage – we had to weld it up,” admitted the Frenchman later. As the race entered the last half-hour, Anthony Mott, now in the Ferrari F40, caught and passed Firman’s Porsche, and Stretton brought the Aston in for a further 50 litres of fuel. Tony Rodriguez ground to a halt at Hawthorns, got going again, only to expire again at Clearways. Once recovered to the pits, the red and white BMW was rapidly fixed, and hurried out of the pit lane, only to coast down the hill out of Paddock, out for good this time, or so it seemed. The flying Lockie had capitalised on Stretton’s late fuel stop, and had now unlapped himself from Slater, but with 20 minutes to go, making up a lap on the more powerful Porsche was a big ask, even by Calum’s standards. Rodriguez had managed to fire up his errant BMW again, and from the safe area at bottom of Paddock, made a hesitant move onto the track just as Slater came by, causing the Eurotech Porsche to almost stop dead in its tracks. It really was over for Rodriguez this time, as he slipped down the hill and into the back entrance of the paddock. And so it ended, 74 laps for Slater and Sumpter, 72 seconds ahead of McCormick and Lockie’s Ferrari. Paul Drayson and Martin Stretton weren’t disappointed with third place; “We knew that second stop would nail us, and we were hurt by the maximum 50 litres of fuel allowed – we just used the maximum every time. It’s been good fun, though,” said Stretton. The top three were all in the GT3 class, and first GT Cup finisher, fourth overall, was the Marcos Mantis of Jon Harrison and Richard Gomes. The pair had upheld the honours of the Topcats Mantis squad after the retirement of the Mercer / Bullock machine, and the class win was a fitting reward. 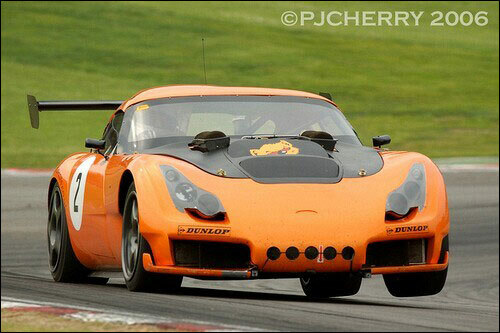 “It didn’t come to us, we had to work for that one,” said Britcar stalwart Harrison. 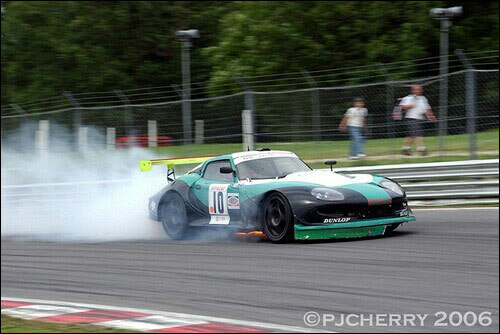 Second in GTC went to the #3 Morris / Firman Porsche, and third was, once again, the Topcats TVR Sagaris. This had been a fantastic debut for the car, and a welcome return for Charlotte Gilbert, who appeared on the podium with her shoulder swathed in a makeshift sling from a baby’s shawl, having pulled a muscle. The cars in the top GTRS class didn’t fare so well, a late splash ‘n’ dash dropping the class-wining Sebastiani / Mott down the overall order, the Cook / Pelle Porsche claiming second, though 10 laps down, with the Corsport Marcos LM500 completing its first race weekend with a class podium for Stephen Keating and Mark Powell. 7 1 GRIFFIN/HYDE Vauxhall Manaro V8 0 D.N.F.